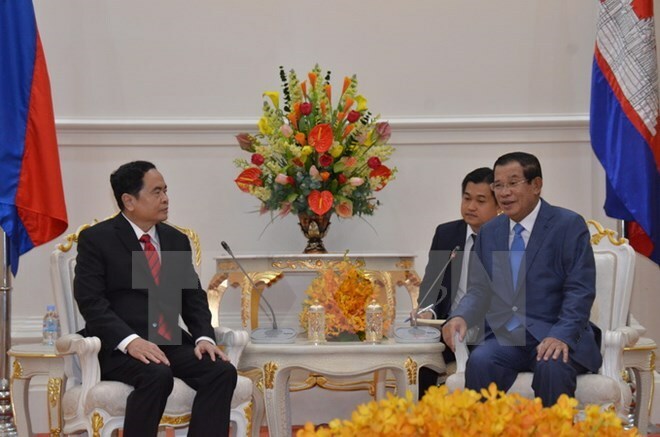 Phnom Penh (VNA) – Leaders of Cambodia hailed their country’s relations with Vietnam during separate meetings with Chairman of the Vietnam Fatherland Front (VFF) Central Committee Tran Thanh Man in Phnom Penh on August 14. President of the Cambodian Senate and Vice President of the Cambodian People’s Party (CPP) Sai Chhum said amid the 50th founding anniversary of the two countries’ diplomatic ties, Man’s official visit to Cambodia from August 13 to 17 is a great contribution to their good neighbourliness, traditional friendship, comprehensive cooperation and long-term sustainability. On behalf of the Cambodian people, he thanked Vietnam for helping his country to re-gain peace and justice in different stages of history during which the cooperation between the Solidarity Front for Development of Cambodian Motherland (SFDCM) and the VFF helped promote the two nations’ unity and mutual support. The connection and active cooperation between the Cambodian and Vietnamese governments and people have helped ensure peace and stability in their respective countries while building peace in the region and the world, he noted. Sai Chhum stressed that the Cambodian Senate and Government always support the completion of the two countries’ border demarcation and border marker planting, 84 percent of which has finished. The completion will leave precious heritages for generations of Vietnamese and Cambodian people. At another meeting, President of the National Assembly of Cambodia, Honorary President of the CPP and President of the SFDCM National Council Heng Samrin congratulated Vietnam on its recent development, voicing his belief that under the clear-sighted leadership of the Vietnamese Party, State, National Assembly and Government, the Vietnamese people will surely obtain more successes. He once again acknowledged Vietnam’s assistance to his country throughout history, including the great sacrifice of Vietnamese volunteer soldiers in the fight against the Pol Pot genocidal regime. He agreed on Man’s proposals, including the two Governments’ promotion of cooperation agreements, and expressed his hope that the SFDCM and the VFF will continue their cooperation to meet both sides’ demand. Meanwhile, Prime Minister and CPP President Hun Sen affirmed that over the past 38 years, the two countries have been developing stably and building a borderline of friendship and cooperation. It is necessary for them to exert every effort to enhance bilateral economic relations. A measure to bolter these ties is facilitating Vietnamese and Cambodian people’s travel to the other country and creating favourable conditions for more than 1 million Vietnamese tourists to come to Cambodia this year. At the meetings, VFF Central Committee President Tran Thanh Man affirmed that Vietnam always prioritises the enhancement of the countries’ good neighbourliness, traditional friendship, comprehensive cooperation and long-term sustainability. He highly valued the SFDCM’s active contributions to bilateral relations, especially in educating the two countries’ people on the bilateral solidarity and the responsibility for maintaining this valuable asset for future generations. He noted the VFF will work closely with the SFDCM to effectively carry out the agreements between Vietnamese and Cambodian leaders and the two governments’ cooperation deals, particularly the joint statement on enhancing the Vietnam-Cambodia friendship and cooperation issued during Party General Secretary Nguyen Phu Trong’s visit to Cambodia last July. Man also took this chance to call on the Cambodian leaders to support and accelerate the land border demarcation and marker planting. He asked both sides to increase transport connectivity, boost investment in infrastructure at border gates, and coordinate more strongly in searching for and repatriating the remains of Vietnam’s volunteer soldiers and experts who died in Cambodia.